How to turn off Camera IR LEDs? Hope putting link is OK. The camera has those IR LEDs on the sides always on, no matter if it is a day or night. The thing is that camera is going to be used few times a year so there is no reason to have those LEDs always turned on. file but that does not change anything. Still LEDs are always on. Any clues guys how to turn off those side, infrared LEDs? Re: How to turn off Camera IR LEDs? Those LEDs have a light sensor connected to each one, so they shouldn't turn on unless it is dark. There is no other way of controlling them without modifying the hardware. Are you suggesting that my setup might be broken and i should return the camera? If you look very carefully at the IR modules, you will see a silver component with a cross-shaped cutout in the middle in which you can fit a small-ish phillips head screwdriver. Those are for adjusting the point (ambient brightness) at which the LEDs turn on and off. And be aware that those are the CRAPPIEST adjustment screws that this world has ever seen. It is unbelievably impossible to adjust them properly. Further, be aware that if you do adjust them for a sensible on-off brightness level, then the LEDs will NOT be able to achieve maximum brightness. But this is probably not a bad thing, because when those LEDs hit full brightness, they get blazing hot. Using that switches the IR filter on and off (it moves it out the way). With the IR filter on, you'll not see in the dark, with it off you'll see in the dark but get a pink colour to you image. This can also be set by wiring up a gpio pin if more control is needed. The LEDs are always on, but current to them is altered by the light sensor, it is full automatic. You'll need to take them off the camera and switch them via a gpio and a circuit to turn them on and off. It is not fault, it is the design. Or a variation of one. I have the same concern with the same IR Led. I had exactly the same idea as you describe. I want to block the light sensor (put duck tape or whatever in front of it) and link both screws holes to RPi. One to GPIO, other one to ground. According to the measure I got, the LED receives 3.3V from the camera, exactly what's the GPIO delivers if I'm not wrong, so far so good. So does it makes sense? Is it what you've suggested bensimmo? 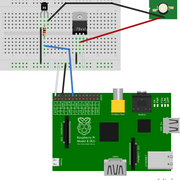 Do I need to add a resistor between the GPIO and the LED? Is there polarity? The GPIOs can safely deliver up to about 16mA each (50mA total). The LEDs need a lot more than that. You'd need a separate power supply and switching transistor to control them. Even the 3.3V power pins on the GPIO connector aren't rated high enough to drive those LEDs correctly. So it is possible to connect the LED to camera and use the GPIO as a switch between both? Technically the LEDs are pulling more power than the camera cable/setup on the Pi was designed for (that came from an RPI engineer). It's why everything, especially a PiZero get very hot when using them. I would measure what the LEDs need, they are LEDs so have a positive and a negative. Unfortunately I cannot test at the moment (yes I have some). The big lens over the LED just pulls off so you can see what is under it. I would look at powering them from the 5V/GND pins, it should be able to deliver the power once adjusted down to 3V3, the LED may take 5V, I have no idea but its not worth testing to find out (they will blow if they cannot). 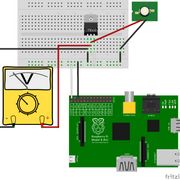 Then use a gpio to switch that circuit on and off. You will need to find out/work out a safe circuit. Should I use this circuit (Obviously, I have to figure out what values I need for resistors). 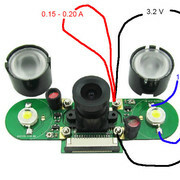 I know the LED receives 3.3 V from the camera. Not sure about the current. They are rated 3W, it means they should draw ~ 1A. According to this post, it could be possible that LED is not 3W. 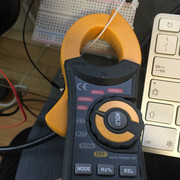 I've measured few things with my DC Clamp Meter. Not sure if the current measure is reliable though. My meter lowest selection is 40A. Do you think I make the calculation for the circuit, based on these values? I've searched on Internet for this IR LED real specs and can't find anything except the High Power 850m 3W. So, should I rely on the metrics I got or the 3W it's rated? Actually, I've just found it on this forum. Last edited by Janet951 on Fri Nov 02, 2018 4:16 am, edited 1 time in total. Janet951 wrote: I find when enabling/disabling the IR Light checkbox, to get it to take effect right away I have to cycle the camera in & out of day/night mode. Never had to reboot. What do you mean by "IR Light checkbox"? Still searching for a solution. I've been told that a 3.3V regulator should be enough because it has already transistors on its own PCB. It must already control the current and voltage. After reading the datasheet of the regulator (LD1117V33), I gave it a try. IR LED doesn't light up and Voltmeter reports 2.2V as soon as the IR LED is plugged. When I remove the LED from the circuit, Voltmeter reports 3.3V. I found the issue. The problem is that I've trust the + and - symbols on the PCB of the LED. There are actually inversed. Now the LED lights up. Time to add the transistor and drive it with the GPIO. I've finally found a solution that fits my need. But I guess it should do the trick for OP's question. I'm a newbie in electronics so experts can correct me if I'm wrong. This is the circuit I've created. Nothing new. Almost all the searches I've made point to a similar circuit. But I didn't want to plug wires without understanding what I was doing. Be sure to obstruct the light sensor of the IR LED. We want to have a closed circuit all the time to control the IR Led. I think we can get rid of the regulator if the IR Led is plugged directly to a camera that can drive it (such as what OP bought). I think NoIR official cam can't. - A transistor (2N2222) - EBC. It can support up to 800 mA which is fine. IR LED should draw up to 350 mA max. - A resistor 1K Ohm (between Transistor Base and GPIO pin). To avoid the RPi pin to receive too much current. The light is off when the raspberry starts. I can turn it on for 30 seconds with this script. I've measured current of GPIO and LED when the circuit was closed. Thanks for posting this, it's exactly what I've been looking for. I have the same camera set up as OP, and I was looking for a way to control the IR through a Python script that I schedule to run every night., which obviously means I can't leave them connected to the camera. I have one question, electronics aren't my strong point, why are we using a regulator to push it down to 3.3V from the 5V pin instead of just using the 3.3V pin?